No matter how deep you dig, it’d be hard to find a truck model that has copped more competitive assaults than the seemingly ageless ACCO. At one time or another almost every brand that has ever contested the Australian market has had a purposeful swipe at this home-grown hero, which is arguably the greatest survivor in the history of Australian road transport. In fact, the iconic ACCO has endured like no other, first under the International banner and now Iveco. Still, despite its decades of resilience and likewise, its vital and ongoing role in the viability of Iveco’s local manufacturing operation, ACCO’s place in the market is today a shadow of what it once was. Back in the days of International, for instance, it was a mainstay of the medium-duty single-drive rigid market. The Japanese, however, ultimately killed ACCO’s vast volumes with trucks that were simply better specified and in most cases more durable. A new era had arrived and International simply had no answer to the Japanese onslaught. Consequently, for many years it seemed the only place where the battle-hardened workhorse would retain its historic ‘truck of choice’ status was in the six- and eight-wheeler strongholds of concrete agitator and waste collection work. And for many years, that’s exactly what happened until a couple of competitors conceived highly-effective models targeting ACCO’s dominance in the concrete agitator business. Iveco’s tough and tireless ACCO. Strangely perhaps, a Mack conventional was arguably first to throw down a serious and carefully targeted gauntlet to ACCO’s prowess in agitator applications. The baby of the bulldog bunch, the Metro-Liner offered exceptional tare weight, much the same proven driveline as ACCO, a turning circle that was at least competitive with its cab-over rival, and critically, an eight-wheeler version. Keen to emulate Mack’s undeniable success, Freightliner and its former Sterling stablemate jumped into the fray; and not to be left out of the contest, Kenworth crafted dedicated derivatives of its T3 range. In what now seems a heartbeat, the agitator business has become swamped with aggressive competitors. The latest whack has come from Isuzu with a cleverly configured range of three-, four- and five-axle rigids, which quickly won significant business from several major concrete companies. And as cab-overs, the Japanese trucks are probably a greater threat to what remains of ACCO’s agitator business than any other brand. Sure, ACCO is still an effective part of the competitive mix and it certainly has its loyal advocates, but there’s no question its present place in the agitator market is a dull shadow of past glories. Despite the declining agitator market, the waste collection business is an entirely different ballgame and while several makers have already tried knocking ACCO from its pre-eminent position at the top of the pile, the old stager’s standing in the market has largely withstood everything the competition has thrown at it. 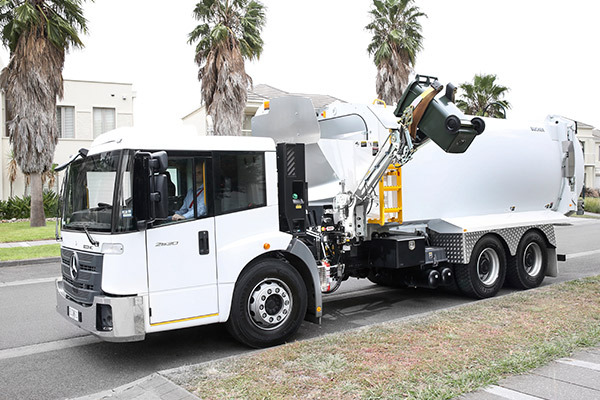 Indeed, when it comes to domestic waste collection, particularly the side-loader variety, ACCO has for decades had no peer in the minds of most waste collection companies. There have, of course, been suggestions that the emergence of specialist garbage gatherers such as Dennis Eagle would eventual knock ACCO off its perch but except for a couple of instances, the local hero remains firmly entrenched at the head of the heap. As this shot of an ACCO interior shows, modern waste collection work isn’t quite as simple as it might seem from the outside. 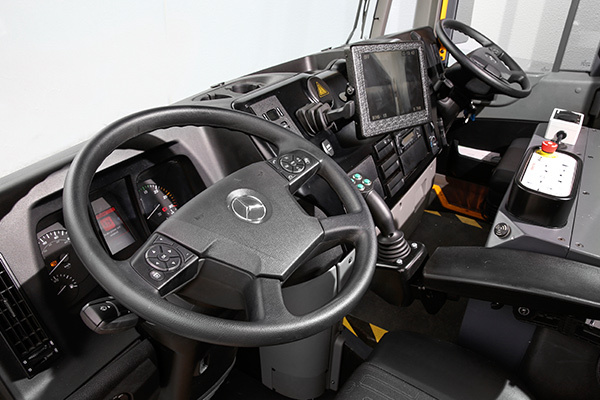 Simplicity of design, a largely bullet-proof specification backed by decades of proven performance, and most importantly, a locally developed dual-control steering system said by those in the know to be far and away the best in the business, are the factors that keep ACCO in the ascendancy. 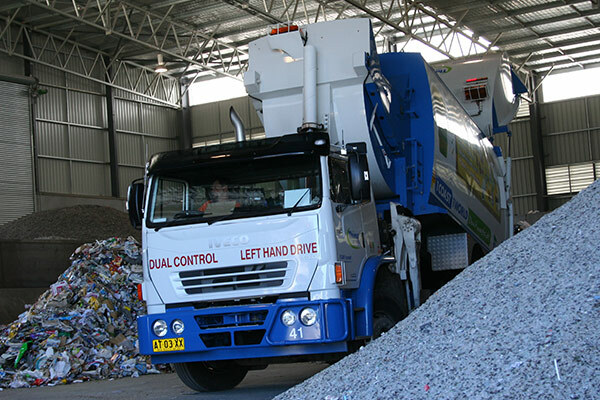 As a senior operations manager with a major waste collection company told me almost a decade ago, soon after he’d endorsed an order for more than 60 new ACCO side-loader trucks, "… when it’s all boiled down, things like the quality of the dual-steer system, parts prices, tare weight and the truck’s track record in waste collection made it an easy decision to stick with ACCO." That comment probably remains as relevant today as it was back then, aided in no small part by pricing that has been amortised over decades of local manufacturing. But even so, times change and the one sure constant about the commercial world is that competition does not go away. It might endure setbacks and even retreat with its tail between its legs, but eventually it’ll come back smarter and stronger than before. To put it bluntly, the competition has improved and ACCO, for all its long-term leadership, hasn’t changed much at all. Now, for instance, two of the big boys in the truck world have almost simultaneously presented dedicated side-loaders aimed squarely at offering modern, viable alternatives to what some see as an archaic remnant of trucking history. Call it what they like though, knocking ACCO over won’t be easy but one thing appears certain; Mercedes-Benz and Volvo are about to give it a big shot with their own purpose-built dual-control models. Local launch. Australia is the first market to offer a dual-control version. 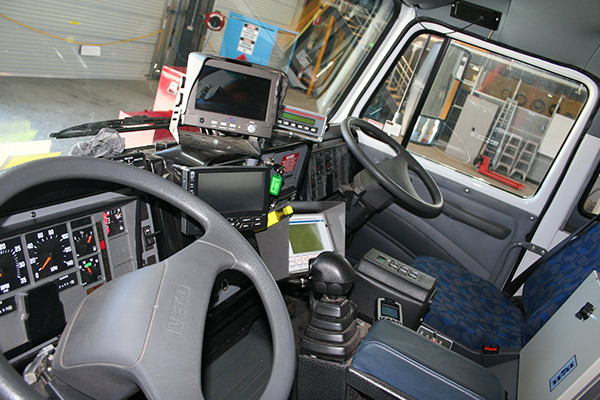 First released on the Australian market in 2012 and boasting excellent forward vision, exceptionally low entry into the low-roof aluminium cab, and huge frontal overhang, it was apparent from the outset that Econic’s local potential as a waste collection truck would only be realised with development of a dual control system to compete with the market-leading ACCO. The dual-control system was developed in Germany to meet Australian requirements. The powertrain starts with a 7.7-litre turbocharged six-cylinder engine pushing peak outputs of 299 hp and 1200 Nm (885 lb ft) of torque through an Allison six-speed auto transmission into a hub-reduction drive tandem mounted on airbag suspension. The front axle also sits on airbags. The engine operates at the Euro 6 emissions level and combines a high level of environmental efficiency with noise levels said to be notably lower than its Euro 5 equivalent; a vital consideration in sensitive suburbs. In typical Mercedes-Benz fashion, safety figures highly with standard inclusions of disc brakes, electronic stability program, anti-lock braking system, two-stage engine brake and LED day-time running lights. Optionally available is a ‘Safety Pack’ containing an emergency auto brake, lane departure warning system and radar-based adaptive cruise control. Main new attraction. 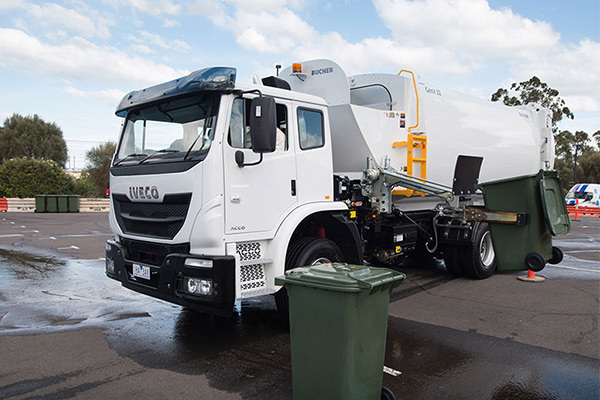 Volvo’s first dual-control FE at the recent waste management event in Melbourne. 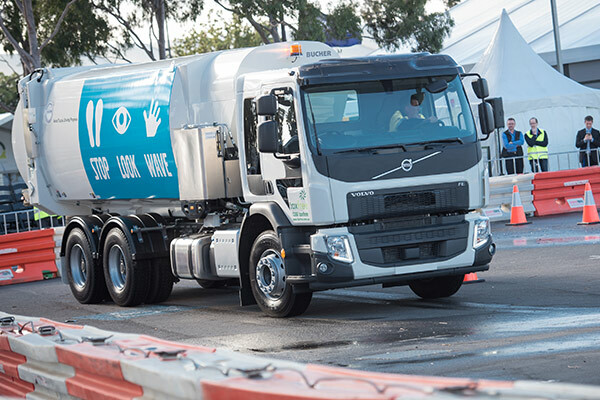 Then there’s the Volvo offering with another world first, the ‘world’s first dual control FE’ officially launched a few months back at the Waste Management in Action event in Melbourne. This certainly isn’t Volvo’s first snap at the domestic waste collection business but from all appearances, it will definitely be the most determined. 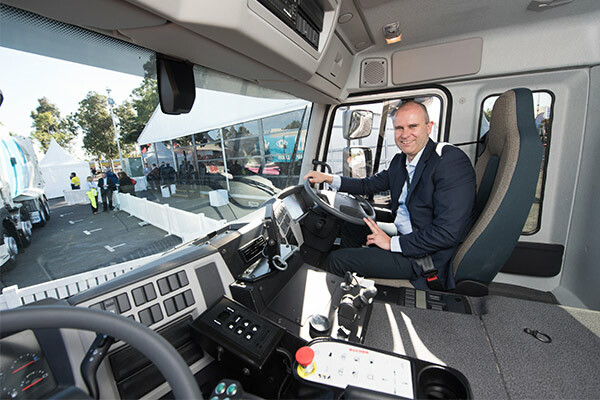 "This truck has been designed and adapted locally and in consultation with leading Australian waste management companies to meet and exceed the tough requirements for this market," said Mitch Peden, vice-president of Volvo Trucks Australia in a prepared statement at the truck’s launch. Like its Mercedes-Benz rival, the Volvo comes with high levels of standard safety features, not least anti-lock brakes and an electronic stability system to reduce the risk of skidding and roll-over. There are also a wider windshield and extra side mirrors. "The new truck has unparalleled driver visibility and improved driver ergonomics," Peden continued, "and most importantly, features world-class safety and technological innovations including forward collision warning and emergency braking as standard on the 6x4 model." Volvo truck boss Mitch Peden inside the FE. A truck featuring, "… world-class safety and technological innovations." Meantime, the FE also includes Volvo’s latest electronically-controlled rear air suspension system, improving driver comfort and truck stability by controlling chassis height and compensating for uneven load distribution as each bin is emptied into the truck. As you might’ve deduced by now, there are many similarities in the offerings of the Swede and its German rival, extending to the powertrain specifications of both brands. Under the FE cab is Volvo’s 8-litre Euro 6 engine with lively performance figures of 320hp and 1200Nm (885lb/ft) of torque delivered into a six-speed Allison automatic and putting power to the pavement through a hub-reduction drive tandem. At the waste management event in Melbourne, Volvo was quick to point out that the FE ‘has long been a stalwart of the waste management segment globally’ and makes no secret of its desire to achieve the same stalwart status here. Again, it won’t be easy for Mercedes-Benz or Volvo to crack a market where existing loyalties run deep and strong. Even so, Iveco’s tough and tireless ACCO could now be in for the fight of its life. Literally!